Annoucing the release of Scheherezade’s Bequest Volume 1, Issue 2 — Something Rich and Strange: Tales from the Sea. 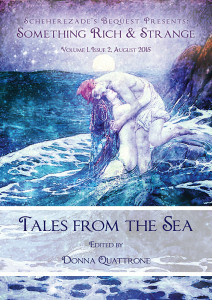 For this issue we called authors to draw from folktales, personal experience, and the vast ocean of the imagination to reveal selkies, mermaids, sea nymphs, the great flood, and more in this wonderful collection of short stories and poems, each one a siren song luring us into the waves. Something Rich and Strange: Tales from the Sea continues our tradition of offering original fairy tales and retellings of the old stories that leave us with a sense of wonder, a sense that something rich and strange is always just around the corner. The kind folks over at Fairy Tale News have given this issue a glowing review, complete with excerpts and a glimpse at the pages.